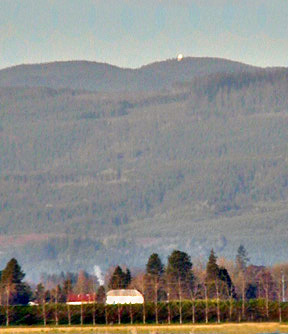 The white dome is a VOR radar station for aircraft navigation, and is manned by the FAA. On a clear day, the Pacific Ocean is visible, less than 25 miles distant. Valsetz, a booming company-owned logging town, used to nestle on the south slopes of this mountain massif. In its day, Valsetz was probably the rainiest town in the entire State of Oregon. The town was razed when the company closed up shop and closed down the town a few decades ago. Getting to the Coast from Dallas via the site of Valsetz is a very interesting and lengthy journey; if you try it, it's best to have a more rugged vehicle like an SUV.